I joined this online cooking group in 2011 because I wanted to try my hand at some French cooking. What I ended up with was more than I had anticipated, namely lots of lovely, creative and very supportive blogger friends, a.k.a. Doristas. And we now eat French food (well, as French as can be after we've fiddled with Dorie's recipes!) at home at least once a week. 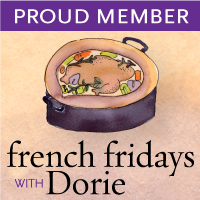 This weekly event is hosted over at French Fridays with Dorie. How did I miss this! I must show this to all my french friends. They've been telling me how its hard to find the right ingredients for french cuisine. Your blog is wonderful - i've kept it on bookmark. Thanks so much for your kind comments, SM! You'll see that I've made a few spins on Dorie's recipes so some of them might not turn out so French after all :). Hope you'll continue to enjoy reading this blog, nevertheless!